FOREIGNER, the classic British-American rock band is donating its hit song I Want to Know What Love Is to Shriners Hospitals for Children. FOREIGNER recently recorded a special version of the song with Kelly Hansen as lead vocalist and created a new music video featuring Shriners Hospitals for Children patients. The new release of I Want to Know What Love Is now is available for download on Google Play and iTunes. FOREIGNER is donating all sales proceeds to Shriners Hospitals for Children. The Mick Jones composition I Want to Know What Love Is hit the top of the charts all over the world when it was released in 1984, and is FOREIGNER’s biggest hit to date. It remains one of the band's best-known songs and is listed as one of Rolling Stone Magazine's greatest songs of all time. “There is a spiritual undertone to I Want to Know What Love Is, and when you apply the lyrics to a cause like Shriners Hospitals for Children, it brings a whole new meaning to the song,” said FOREIGNER lead guitarist and songwriter Mick Jones. You may donate or download FOREIGNER music online. Since 1922, Shriners Hospitals for Children has provided pediatric specialty care to children with orthopaedic conditions, burns, spinal cord injuries, and cleft lip and palate. Shriners Hospitals has treated more than 1.3 million children from more than 180 countries over the last 95 years. Shriners Hospitals for Children has locations throughout the United States, Canada and Mexico, and is changing lives every day through innovative pediatric specialty care, world-class research and outstanding medical education. All care is provided regardless of the families’ ability to pay. Shriners Hospitals for Children is a 501(c)(3) nonprofit organization and relies on the generosity of donors. All donations are tax deductible to the fullest extent permitted by law. FOREIGNER is responsible for some of rock and roll’s most enduring anthems including Juke Box Hero, Cold as Ice, Hot Blooded, Waiting For A Girl Like You, Feels Like The First Time, Urgent, and the worldwide No. 1 hit, I Want to Know What Love Is. More than 40 years into the game, FOREIGNER continues to rock the charts with massive airplay and continued Billboard Top 200 album success. FOREIGNER also features strongly in every category in Billboard’s Greatest of All Time listing. The band is consistently in the Top 20 on classic rock radio. As a result of the depth of the catalogue, the band gets more airplay at the format than Eric Clapton, The Who, Fleetwood Mac, Bon Jovi, U2, Bad Company and many of their peers. 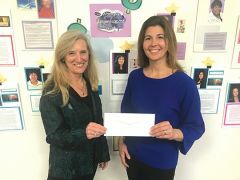 SACRAMENTO, CA (MPG) - Women’s Empowerment has received a $25,000 grant from U.S. Bank Foundation’s Community Possible program. The grant will fund job skills training, career-readiness classes and financial literacy programs for Sacramento women experiencing homelessness. Since 2001, Women’s Empowerment has been working to break the cycle of homelessness for women and children in Sacramento. In the initial nine-week program, women who are homeless receive free onsite child care in the group’s child development center and transportation assistance. Each woman works with a master’s level social worker to address her root causes of homelessness. She attends classes on job-readiness, confidence building, health and empowerment, as well as support groups for domestic violence and substance abuse. Financial empowerment courses are provided, including budgeting, improving credit score and second chance checking. With the help of volunteer teachers, women unlearn financial habits and create a step-by-step action plan for achieving their financial goals. Women then focus on job placement with their employment specialist and volunteer career mentor. Women who have graduated from the nine-week program can enroll in the group’s graduate services at any point when they need assistance. Services include paid job training, vocational certifications, counseling with a social worker and employment specialist, access to a professional clothing closet, and job retention services for employer and employee. Women’s Empowerment is an award-winning organization that has graduated 1,554 homeless women and their 3,738 children. Last year, 82 percent of graduates found homes and 76 percent found jobs or enrolled in school or training. The program combines self-esteem courses, job training, health classes and support services to help homeless women across diverse ages, races and cultures. Women’s Empowerment is funded through private donations from the community and receives no government funding except for in-kind rent from the County of Sacramento. To make a donation: www.womens-empowerment.org. Community Possible is the corporate giving and volunteer program at U.S. Bank, focused on the areas of Work, Home and Play. The company invests in programs that provide stable employment, a safe place to call home and a community connected through arts, culture, recreation and play. For more information: www.usbank.com/community. A Singing Valentine Coming Your Way! SACRAMENTO REGION, CA (MPG) - Valentine's Day is almost here! You can give that special someone an unforgettable gift! Candy, cards and flowers are nice, but adding a Singing Valentine will create a lasting memory! Quartets from Sacramento Valley Chorus will deliver Singing Valentines on Thursday, February 14. Your sweetheart, family member or good friend will be surprised and thrilled when a quartet delivers two songs, a rose, candy and a beautiful card to him or her. The package is only $40, and can be delivered to the home or business of your choice in the greater Sacramento area, including Placer, El Dorado and Nevada County. Singing Valentines are popular, so call early to ensure availability. Call 916-761-2998, to arrange for delivery. The award winning Sacramento Valley Chorus, under the direction of Master Director, Dede Nibler, has approximately 90 members. The Chorus is preparing to compete Internationally in New Orleans in September. Ladies from the community are invited to attend rehearsals any Wednesday night at 6:30 pm. For more information, visit SacramentoValleyChorus.com. Speed Bump Coming for Local Business? SACRAMENTO REGION, CA (MPG) - Employers are downshifting in the hiring race as 2019 begins. One regional company is reducing workforce by more than fifty percent (50%) as tariff related contract losses impact Sacramento area employment. In direct contacts with regional employers between November 19th and December 17th, Pacific Staffing discovered fifty-six percent (56%) of companies are hiring in the First Quarter of 2019. Hiring has pulled back from this same time one year ago when sixty-five percent (65%) planned to hire in January, February and March. While the pace of hiring among top Sacramento regional employers has fallen throughout 2018 companies report finding applicants and specific skilled workers remain a top challenge in the new year. While not a single company surveyed planned first quarter layoffs in 2018, in the first three months of 2019 seven percent (7%) are reducing workforces. Staff reductions are attributed to seasonal change and slower demand for products and services. Forty-four percent (44%) of hiring in the first quarter is for attrition, or replacements, among existing workforces while employers seek just forty-two percent (42%) for growth. By talking to top regional firms each quarter since 1992, Pacific Staffing has learned there are always hiring challenges for employers, regardless of economic direction. In this first quarter of the new year seventeen percent (17%) of employers also report a continuing challenge with finding enough applicants, despite the slowdown. Others also citing increased minimum wage and hiring specific skilled trades as workplace concerns. Sales, customer service, accounting/finance, technical, warehouse and shipping experience is in high demand through March. Drivers for route and delivery remain scarce. The most active sector is Service companies with Manufacturers second, followed by Construction and Retail through January, February and March of 2019. For more information, employment blogs & market surveys go to www.pacificstaffing.com. SACRAMENTO REGION, CA (MPG) - SMUD’s Board of Directors recently recognized the 21 college students who have been awarded Powering Futures scholarships for the 2018/19 academic year. All students received scholarships between $1,500 and $5,000, and the opportunity to work at SMUD as a paid intern. The awards were based on academic merit and financial need, and preference was given to students who have declared a major relevant to SMUD. Most of the students who receive a scholarship also accept paid summer internships in a variety of SMUD departments, including Grid Operations, Customer Operations, Geographical Information Systems, Warehouse and Fleet Operations among others. The internships provide students with excellent opportunities to learn practical skills and help launch themselves into future careers. The 2019/20 scholarship application period began on January 7 and will close on February 24. For those interested in applying, please visit,smud.org/Scholarships. SACRAMENTO, CA (MPG) - Senator Ted Gaines (R-El Dorado) was sworn in as an elected Member of the California State Board of Equalization (BOE) during a ceremony held at the Stanley Mosk Library and Courts Building in Downtown Sacramento. The oath of office was administered by Governor Gavin Newsom. Senator Gaines will represent more than nine million California residents living in the 1st Equalization District, which spans inland California from San Bernardino County to the Oregon border. The five-member BOE is a publicly elected tax board responsible for administering Property Tax, Alcoholic Beverage Tax, and Tax on Insurers programs. “Californians should be treated with respect and fairness when it comes to tax administration. They are tired of being over-taxed, and over-regulated. I pledge to fight on their behalf,” said Senator Gaines. Prior to being elected to the BOE, Senator Gaines served 12 years in the State Legislature as a tireless advocate for California’s taxpayers, ratepayers, businesses and families. He fought to protect citizen privacy and led major efforts to bring thousands of new jobs to the state, as well as support critical legislation to strengthen and expand California’s infrastructure. In addition to his life in public service, Senator Gaines is a successful small business owner, having owned Gaines Insurance for more than 30 years. He has been married to his wife Beth since 1986 and together they reside in El Dorado County and are blessed with six children and two grandchildren. As a constitutional officer, Senator Gaines is currently the highest-ranking elected Republican state official in California. SACRAMENTO, CA (MPG) - Sacramento-area young professionals can show off their knowledge of early 2000s trivia while raising funds to help local kindergarteners save for college at United Way’s Young Leaders Society’s annual Brews & Brains trivia night on Feb. 8 from 5:30-8 p.m. at the Sacramento Masonic Temple, 1123 J Street. Guests, who must be age 21 or older, will enjoy beer, food and chances to win prizes. 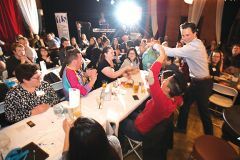 Guests who register as a team of six by Jan. 28 will receive the early bird rate of $135, which includes a Brews & Brains pint glass, and food and drink tickets for each team member. Individuals and couples can register for $25 each to be placed on a team and receive food and a drink ticket. To learn more: www.yourlocalunitedway.org/brewsandbrains2019. Research shows that children with even modestly funded college savings accounts are three times more likely to attend college – and four times more likely to complete college – than those without a college savings account. Parents and guardians who attend two free financial education and empowerment courses earn a $200 college savings account for their kindergartener. Parents, relatives and friends may make additional contributions to help grow the student’s account. The program recognizes that early intervention and continued parental involvement dramatically increase the probability that children will achieve higher education. For nearly 100 years, United Way California Capital Region has brought local people together to make community change happen. Today, the nonprofit is bringing people together across Amador, El Dorado, Sacramento, Placer and Yolo counties for its Square One Project, a 20-year promise to significantly increase the number of students in our region who graduate from high school ready for success in college and beyond. United Way believes ending generational poverty starts in school and is working to ensure kids meet important milestones and their families receive support and resources. To learn more and make a donation: www.yourlocalunitedway.org.